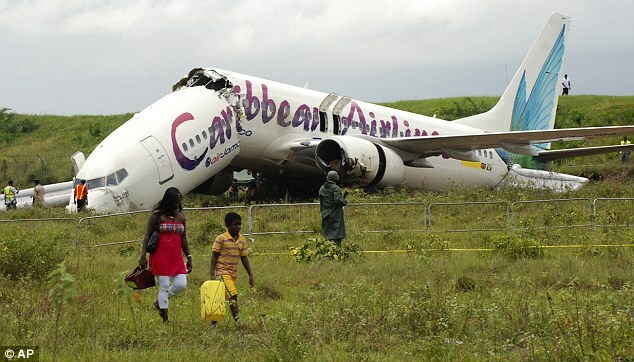 A jet carrying 163 people broke in half as it crash-landed in the South American country of Guyana. 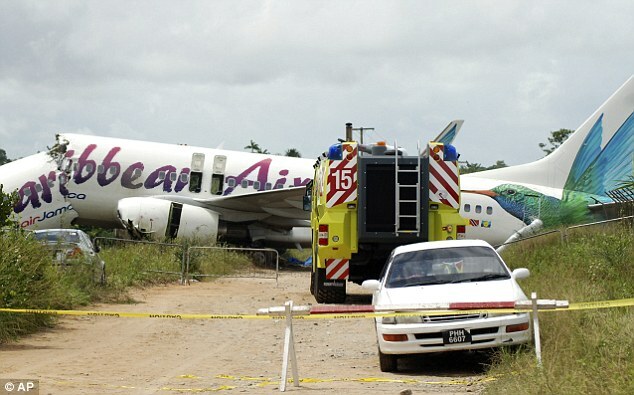 Incredibly, nobody was killed and only a few passengers were injured after the Caribbean Airlines Boeing 737-800 from New York overshot the runway at Georgetown's Cheddi Jagan airport in wet weather. It slid through a chain-link fence and barely missed a 200-foot ravine. Had it fallen into the ravine it would have almost certainly killed crew and passengers. The crash happened just after midnight local time as it arrived from the Caribbean island of Trinidad, where it had made a stop before continuing its flight to Georgetown. 'It's an absolute miracle what happened here in Georgetown,' said Caribbean Airlines chairman George Nicholas, as he visited the crash site. 'Everything started caving in and the girl next to me just sat there motionless in shock,' said passenger Betsy Myndyllo, who escaped with the help of her nephews and left the crash on foot, in the dark, arriving at the terminal 20 minutes later. 'I saw death flash before me,' said Guyanese-born Maxine Eversley, whose husband and niece were injured as they jumped to safety after the crash. One woman said simply 'it was terror', while another described how the passengers' applause at the safe landing 'turned to screams' when they released the plane had broken in half. A passenger managed to push open an emergency exit and most managed to clamber out by themselves, but rescuers struggled to free people in the dark as there was no emergency lighting. 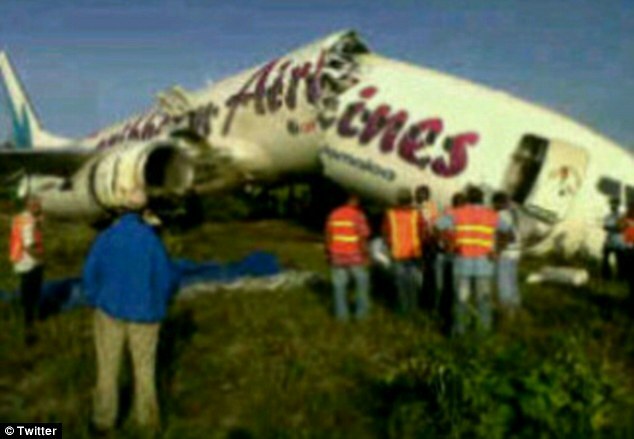 Caribbean Airlines said it did not know the cause of the accident, which happened during good visibility and light rain. Investigators from the U.S. and Guyana were sent to retrieve the black box. The country's health minister, Leslie Ramsammy, told French news agency Agence France Presse that one passenger suffered a broken leg while several others walked away with minor bruises. All of them were taken to a hospital in Georgetown. Flight BW 523 was carrying 157 passengers and six crew, the airline said in a statement. Around 100 required medical attention, and four were hospitalised with serious injuries. Geeta Ramsingh, 41, from Philadelphia, was one of the injured passengers. She was returning home to her native country for only the second time in 30 years. She said that passengers had just started to applaud the jet's touchdown when it 'turned to screams'. She escaped the craft by hopping on to the wing and and then on to the dirt track outside the runway fence. She said: 'I am upset that no one came to rescue us in the dark, but a taxi driver appeared from nowhere and charged me $20 to take me to the terminal. She added: 'I realised that everything was on top of me, people and bags. I was the second to last person to get off that plane in the dark. She also said her husband opened an emergency door, allowing passengers to escape the craft. The airport was closed, leaving hundreds of passengers stranded and delaying dozens of flights. At first, the authorities struggled to reach passengers due to a lack of lighting and emergency equipment. 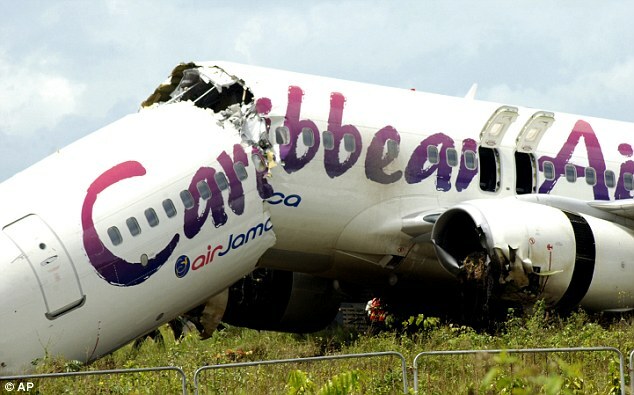 Devant Maharaj, transportation minister in Trinidad where Caribbean Airlines is based, said the company is sending a team to Guyana to help investigate the crash. President Jagdeo has also asked for assistance from the U.S. National Transportation Safety Board. 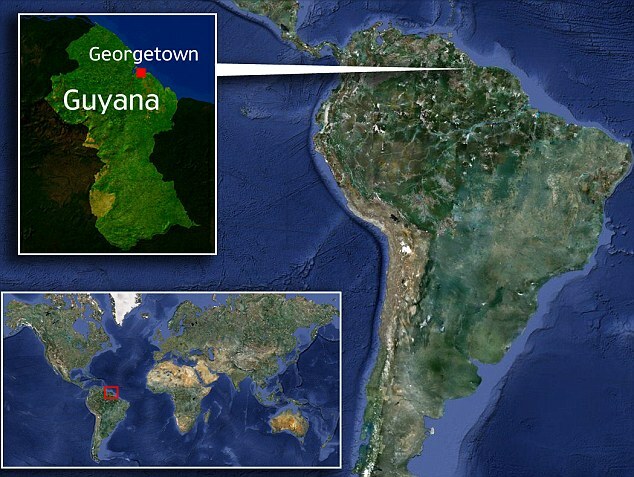 The crash is the worst in recent history in Guyana, the only English-speaking country in South America. It is one of only a few serious incidents involving the Trinidad-based airline, which is the single largest carrier in the region, operating at least five daily flights.